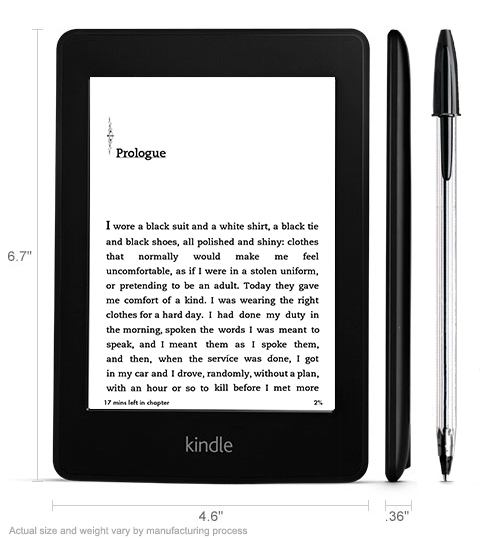 Today Amazon announced their latest-generation e-reader, the “All-New Kindle Paperwhite,” starting at $119. I’m not really sure about the name. First of all, it’s not exactly “all new,” although that’s not necessarily a bad thing, since the Kindle has been refined over time and is a pretty great e-Ink-based e-reader. I guess Amazon didn’t want to name it the “Kindle Paperwhite 2” or the “Kindle 6,” as it’s the second Kindle generation to include the side lighting system, and the sixth Kindle generation overall. It is available with “Special Offers” for $119 (with free shipping), or without them for $139, and ships September 30. Also coming soon is the version that also includes 3G wireless connectivity (in addition to Wi-Fi), coming November 5 for $189. It looks to me like a solid, although not necessarily game-changing update to a very successful product. Better contrast (which was already excellent starting with the Kindle 3 and getting better from there) is always welcome, as is the faster processor. If any readers get their hands on one, please leave me your hands-on experiences in the comments below. Thanks! The newest Kindle (Kindle 5? ), called the Kindle Paperwhite, came out a couple of weeks ago, and from all the reviews I’ve seen, it’s a big hit. The main new feature is the side-lit e-Ink display, which allows for reading at night or in low light, while still retaining the easy-on-the-eyes nature of e-Ink and ability to be read in direct sunlight. Reviews also say the lighting is more even than the similar Nook Glowlight, and that it noticeably improves the contrast of the display (Amazon says by 25%), because it makes the greyish background look more white. In the pics and videos I’ve seen of it so far, that was the first thing I noticed — the effect seems pretty dramatic. The display is also higher resolution (212 ppi vs. 167 ppi, or 62% more pixels) than the previous e-Ink Pearl screen used in the last two Kindle generations. The battery life is supposed to be excellent — 8 weeks even with the light on (at 30 minutes per day). All the reviews I’ve seen have reported that the battery life is excellent — you’ll probably only need to charge it once a month or less. The software on the new Kindle Paperwhite is a big departure from the simple, text-based lists that dominated the older Kindle user experience. The user interface is much more “tablet-like,” with a scrollable list of book covers, and a strip of menus across the top. Everything is accomplished using the touch screen, including adjusting the strength of the light (in 24 steps, from very dim to quite bright), selecting a book to read, shopping in the Kindle Store, or tapping and holding on a word to bring up options to search that word in the built-in dictionary, look it up on Wikipedia, or even have it translated. While the addition of cover art to the home screen seems like a welcome change and an easier way to browse books, Amazon does place a strip of “Suggested Books” or “Bestselling Books” at the bottom of the display — and this is in addition to the “Special Offers” below that if you opted for the cheaper model — which shows that Amazon is selling Kindles and Kindle Fires at very aggressive prices partially in the hopes that users will buy lots of stuff from their excellent and expanding content ecosystem, including Kindle Books and newspapers, as well as videos and songs and apps for the Kindle Fire. In any event, it looks like a solid offering from Amazon. While it came out later than Nook’s Glowlight model, every review I’ve seen has praised the Kindle Paperwhite’s lighting system as superior to the Glowlight’s, so those of you who like to read at night will probably be glad you waited. Do you have a Kindle Paperwhite? Please feel free to share your experiences and thoughts about it in the comments below.